Gods As They Are, 2nd ed. One Armed Flyer. From The Poet's Press archive. This 1976 chapbook was Annette Hayn's second published book of poetry. It was written in memory of her husband, Gerald A. Hayn. 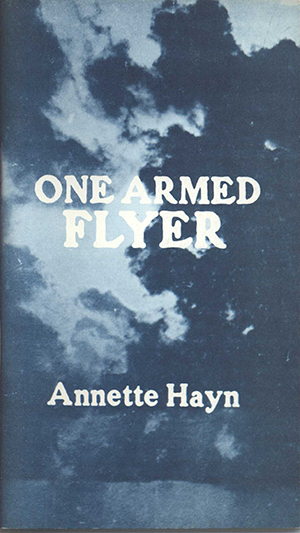 In the introduction, Toby Olson writes: "In the poems in One Armed Flyer, Annette Hayn speaks of a world in which loss is central. It is a world that extends only so far as her own life extends, but it is rendered universal through the clarity of the poet's vision. "The central force of these poems lies in their quiet attempt to understand and express the changes that loss causes. The result is a book of poems, painful, touching, and exact, that speaks to a basic human need." We present here the book's central group of poems, a cycle called "Three Seasons," plus a reconsideration of the temptress "Delilah" and a surrealistic doll house occupied by famous poets. his hair shone in the sun. of whose side you're on. It was the Philistinian lord who gave the orders. It was after all her guilt. for Dagon, the god of war. The pillar, Samson, lean against the pillar. and the cutting of the hairfor that hour. Picasso prints are pasted on the walls. their arms outstretchedfor the next generation. they disappear into adjoining rooms. or hammer them back in. No one to cut the wire. EXPANDED SECOND EDITION OF ANNETTE HAYN'S NEW AND SELECTED POEMS. Chamber Music was first published in September 2001, and was Annette Hayn's last book. 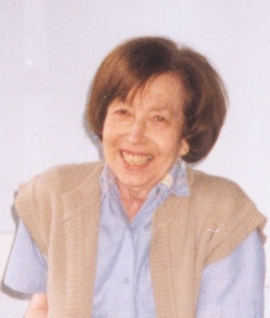 She died in September, 2004. The book was re-issued by The Poet's Press in Spring 2009 with new material: the poet's last, posthumous poems (Memorial to the Moon) and a memoir by poet Mary Ferrari. This 152-page book brings together the poet's best mature work, plus her own selections of the best poems from her earlier books, Rapunzel (1971), One-Armed Flyer (1976), Journeys Around One Point (1980), The Crossing (1984), Calendar House (1990), and Enemy on the Way to School (1994). Annette believed that Chamber Music in 2001 would be her last book, but the final group of poems added for this edition demonstrate that she was still in peak form. This finely-etched, spare poetry, influenced greatly by the example of her early teacher, Kenneth Koch, intersperses the everyday with the surrealistic, walks bravely among her worlds: childhood in Nazi Germany, boarding school in England, family life and the discovery of poetry writing in America, and her final years overshadowed by 9/11 and her own confrontation with mortality. ISBN 0-922558-37-X, paperback, 152 pp., $14,95. Enemy On The Way to School. New second printing for 2016. Poems of a German Jewish childhood in the 1930s. Set against the background of the rising Nazi menace, these poems leave an indelible impression of a lost world, and the eternal alienation felt by those who left it behind. With an introduction by poet Mary Ferrari. ISBN 0-922558-21-3. Paperback $9.95. CLICK BELOW TO ORDER FROM AMAZON. ANNETTE HAYN. ONE ARMED FLYER. "Our people have a variety of ways of leaving us. Our children grow up, our parents age, loved ones die. But in an ironic and certainly poignant sense, the presence of those lost grows stronger in their absence. This is because the fact of their passing changes our total feel for things, and their fixed presence seldom does that. In the poems in One Armed Flyer, Annette Hayn speaks of a world in which loss is central. It is a world that extends only so far as her own life extends, but it is rendered universal through the clarity of the poet's vision. The central force of these poems lies in their quiet attempt to understand and express the changes that loss causes. The result is a book of poems, painful, touching, and exact, that speaks to a basic human need. For the readers of Annette Hayn's poems, loss is a kind of gain." The book is not monothematic, since the poet has included some fine poems that stand on their own, such as her portrait of the biblical Delilah, and the delightful fantasy, "Unlikely Marriage" in which John Ashbery and Emilie Dickinson set up housekeeping in a doll house. With the release of this ebook facsimile, The Poet's Press continues the republication of the best books from our archives. The 218th publication of The Poet's Press. PDF, 4 x 7" , 64 pages. To download and read this FREE Ebook, CLICK HERE. ANNETTE HAYN. JOURNEYS AROUND ONE POINT. This chapbook was first published under The Poet's Press Grim Reaper Books imprint in 1980. The foreword by Mary Ferrari provides special perspective on Annette Hayn's work. long way emotionally; and are reminiscent of Emily Dickinson. Each poem is an oblique glimpse through a small intensely lighted window. One looks in a window at the apparently necessary destruction of "roses / a woman ... " Another looks out: " ... and now the mugger can be seen clearly —". 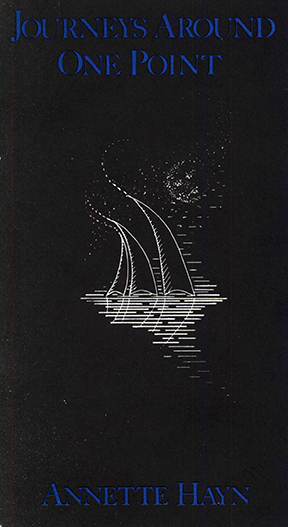 Hayn's poems are miniatures in watercolor; have need of almost no beginning or end; catch that balloon, that voice in flight; are truly "journeys around one point": Annette Hayn's powerful sensibility." The 219th publication of The Poet's Press. PDF, 4 x 7" , 64 pages. To download and read this FREE Ebook, CLICK HERE.